A master of the art of speed painting, Denny Dent's two-fisted painting style will leave you speechless. I was living in Las Vegas in the 1990's when a friend told me about a show that he had been to the night before, he was so excited he couldn't talk fast enough. It was a variety show at Caesars Palace which included an artist who referred to his work as a 'two-fisted art attack'.. The artist's name was Denny Dent, and he painted 6 foot tall portraits of rock stars to the music of the person he's painting. Born April 5, 1948 to a family of well established artists in Oakland, California. Dent said his grandfather was ambidextrous which is where he inherited the ability to paint with both hands at the same time. Although it hasn't been verified, Dent is allegedly a descendant of Titian the master of Italian Renaissance. Denny Dent passed away March 29, 2004 from complications of a heart attack. He was 55 years old. Through the magic of the internet I found a few videos of Denny Dent's performances for my own enjoyment, to finally see what my friend told me about so many years ago, and to share them for your viewing and listening pleasure. Here are a few I found on YouTube. John Lennon, Stevie Wonder, Jim Morrison and Jimi Hendrix. 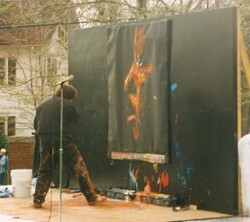 Mr. Dent paints their portrait on a large black canvas while a song by that artist is playing. He uses several brushes in each hand then sometimes he discards the brushes and paints with his hands. He has stated that he could also paint with his feet but didn't want to in public. Denny Dent has been described as the world's first and only rock and roll painter. He referred to his work as “a passionate dance on canvas”. You'll hear him say in his videos “what comes from the heart lands on the heart and it stays there”. Follow your art no matter what form it shows itself to you. In addition to the videos you've seen here, Denny has painted Elton John, Garth Brooks, Mick Jagger, Frank Sinatra and Tina Turner. Not all of his paintings are rock legends. He's also painted politicians and athletes such as Greg Norman, John Elway, Dale Earnhardt and former President Bill Clinton. Share your interests on Wizzley. Sign up here. No I haven't, but that would be a treat! candy47, Have you seen any of the paintings that Denny Dent made with his feet? Chain-smoking, sun glass-wearing United States correspondent/gossip columnist/rock and roll critic for the Vatican Enquirer. Broadcast live on Weekend Update. The world famous Swiss mime troupe who perform entirely in surreal masks, minimal props and no spoken words.